Wayde Burrese of the parks department scours the steep riverbank on Thursday. 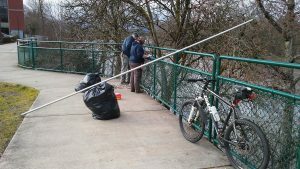 While the eyes of the world were on the change in U.S. administrations, the Albany parks department was dealing with a more mundane but all too real issue: People camping under a segment of the Dave Clark Path keep fouling the Willamette riverbank below with their leavings, and from time to time the parks people have to clean up. I came across one such operation on Thursday. Parks employee Wayne Burrese was scampering along the steep terrain, gathering discarded blankets, garments, plastic sheets and other trash. 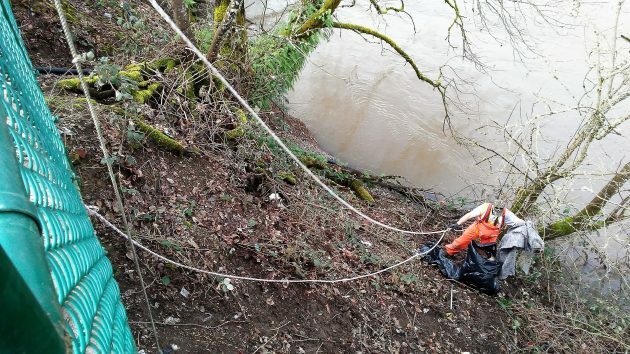 He was tethered to the path above to keep him from landing in the river if he slipped. On the path, a couple of colleagues helped by hauling up what he collected. Rick Barnett, the parks operations supervisor, told me that trash on the riverbank has been a frequent problem. The junk is left by people who camp under the concrete path where it cantilevers out over the riverbank, east and west of where Jackson Street dead-ends on the Clark Path near the Wheelhouse office building. In August 2014, a homeless woman’s body was found underneath the path, apparently dead of an accidental fire. In response, the city posted signs trying to keep people out of the riverbank, but it didn’t work. Now the parks department is exploring what it would cost to build a fence under the bank. A contractor looked at the area Thursday to give the department an idea of the potential cost before the city calls for bids. The estimate was not yet in, but Barnett told me a fence would not be cheap. The posts would have to be closer together than customary in order to make the fence effective, and in places the void is 13 feet tall. “Camping” does not describe the problem. Indigent, mentally ill, illegal drugs, and alcohol abusive people are many and we have no system to combat those issues effectively. I am sorry the well-off City employees are required to clean-up the physical mess but that is what is required to hide the underlying problem. Is the difference between the Homeless and the Homed that those with homes are more likely to be sober rule-followers? How then to explain the majority of criminal activity is promulgated by people living in homes. From your White Collar Crooks (see newest occupants of White House) to your everyday car thief, DUI, opiate addict, nearly all of them have a roof over their head, warm food, access to medical care, etcetera. Conversely, we know from APD Chief Lattanzio’s own mouth that in Albany “crimes against property are down.” You know, simple theft, minor vandalism…petty, irritating kinds of crime more likely to be perpetrated by a homeless person looking for something to trade for booze, dope or food. So, the City’s plan may to build another fence, a la Donny Trump, seems doomed. Covering the entrance to that underpass only drive the homeless elsewhere. Failing to remain sober and following rules may or may not be the cause of homelessness. There is plenty of evidence for other causation all factors. By seeking shelter in a tunnel under a road, these folks are simply trying to survive. If the best the Albany community can do is build a fence, perhaps Donald Trump is the perfect man for our time. Donald must really bother you as you continually bring him up. What a great day to see the pathological liar board the helicopter and go about making money like the Clintons. Ironically, the true pathological liar is our current president, AL ! Notice the word current? Impeachment watch has begun. I’m open to almost any planet where human life is supportable, the Scotch is aged 20-years and the food is good. I admire their “road-map for joint action” and “framework for the allocation of resources and the alignment of programs.” But these have done nothing to decrease the number of homeless or the trash they leave by the Willamette river. Me thinks the government needs a new plan. Huh? Why would the Mayor say this? The local 2009 plan sounds very ambitious and specifically identifies a 10-year goal to end homelessness. will strive to achieve its goals through working with other government partners at all levels, non-profit organizations, the private sector, the faith community and interested individuals. Gordon, that resolution was for supporting the development of the plan. The planning committee agreed it was unrealistic to assume Linn County or even our nation would end homelessness. Someone could be in housing today and out the next. That is why we called ours– A Ten-Year Plan to Address Issues Surrounding Housing and Homelessness in Linn County Oregon. We set goals and strategies and we have accomplished a lot since the plan was completed in 2009. I have a year of experience with a local Albany, 23 yr old, mentally ill, drug addicted homeless man who slept under a bridge, taking free meals at the homeless shelter, who died in a vagrant camp near Costco summer 2016. He had been jailed 11 times and each time was turned back to the street w/o any medications–could not remember to take medications prescribed by Llnn County mental health. We got him enrolled in Cover Oregon, got a primary care doctor located in Corvallis. When we said but he has no way to get there and he is not capable of remembering appointments–LCMH offered free transit coupons which he could not handle. The County Court system did not help him, His parole officer refused to believe the diagnosis of severe mental illness and blamed his plight on drug abuse alone. He was not helped by LCMH because he could not comply with their reporting times. In spite of spending lots of $ on jails, Courts/DA and parole system and mental health professionals, and Cover Oregon enrollment and never getting SSI benefits he died alone. His name was Travis and I tried my best to help him and get him help from the system. Just to get an ODOT ID card took 5 trips to local ODOT office. Every system we have requires the needy person to be a rational, intelligent, cooperative, with time management skills. The mentally ill do not possess those attributes and are not really helped to overcome their plight. Thank you for trying! If you have a cost-effective solution to this seemingly intractable problem, many-many folks would like to hear it. I’m beginning to understand what you said in the post at the top. Agreed but I got lost at point where the PC was in Corvallis. Was there not a PC within walking distance? Please. Ray–cost effective is required. City municipal judge told me he could place Travis is a mental hospital but the city was not prepared to pay the cost. Actually no one has ever calculated the costs of what is done now. When an indigent goes in front of a County judge look at the cadre of people on the public payroll–e.g. 3 deputies,2 clerks, judge, DA, asst.DA, appointed defense attorneys, mental health folks, jail staff. We need to really get a valid cost of currently doing what we do that does not solve the problem. Then look at the cost of housing in mental hospitals to evaluate what is cost effective.